Repair the leak in your inflatable bed with this simple method to ensure your guests get a good night’s rest. 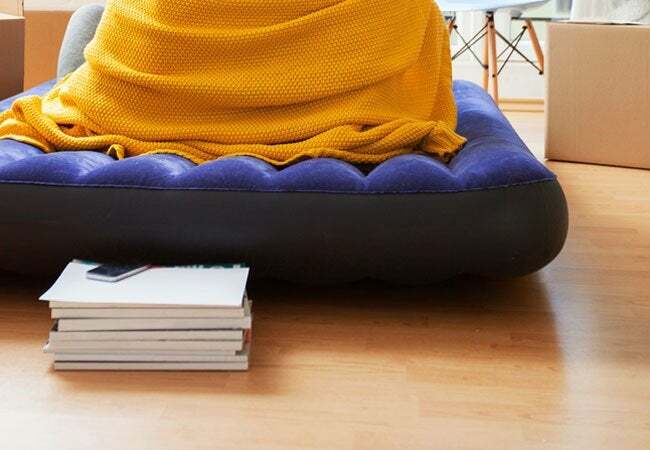 Though invaluable for slumber parties, camping trips, and out-of-town visitors, an air mattress can be rendered useless by a tiny pin-sized hole. Disposing of an inflatable bed would not only waste the $30 to $300 that you paid for it, but it’d add to the landfill since those made of PVC cannot generally be recycled. Fortunately, a pesky leak can be repaired effectively with supplies you may already have on hand and these simple steps for how to patch an air mattress. Keep in mind that a puncture might not be to blame when a mattress deflates: Temperature changes, like the furnace kicking on or off at night, can also cause a loss of pressure. But if a leak is indeed the culprit, act fast! The longer you continue to use the damaged air mattress, the larger the hole will grow—and the harder it will be to repair. STEP 1: Press upon the inflated airbed and listen for the leak. To locate the leak in the air mattress, start by applying gentle pressure to the mattress with your hand and simply listening. Inflate the bed and, starting on the bottom, where leaks are most likely to occur, listening for a quiet hissing sound. Do not lie on the bed to listen; that could enlarge the hole. Work your way around the entire mattress until you find the source of the s-s-s-s-s-s-s, and note the spot with a permanent marker. Deflate the mattress before beginning repairs in Step 4. No luck? Proceed to the next step. STEP 2: Or, try locating the leak with a moisture test. If listening fails to find the leak, dampen your hand or arm and pass it an inch or two away from the mattress from bottom to top. You should feel a cool burst of air at the source of the leak. Note the area with a marker, and then deflate your air bed and skip to Step 4. Otherwise, try one last trick. STEP 3: As a last resort, identify the air leak using soap bubbles. If you’re still stymied, mix a few drops of dish soap with water in a small spray bottle. Working in small sections, spray the solution on the inflated mattress and gently press down. Escaping air from the leak will cause soap bubbles to form where the hole is located. Note the spot with a marker, and deflate the entire bed. STEP 4: Clean around the hole. Clean a small area around the leak extending an inch or two beyond where your patch will be placed with a bit of diluted all-purpose cleaner and a lint-free rag, then dry the area completely with another dry, lint-free rag. If the mattress has a suede-like flocking finish, remove the texture by moistening the area with a rag, sanding gently with a fine-grit sandpaper, and then cleaning the sanded area. This will give a smooth, even surface for the glue to bond. STEP 5: Patch the hole with a kit and strong sealant. If the air mattress came with a patch kit, use that to seal the hole, following the directions provided. 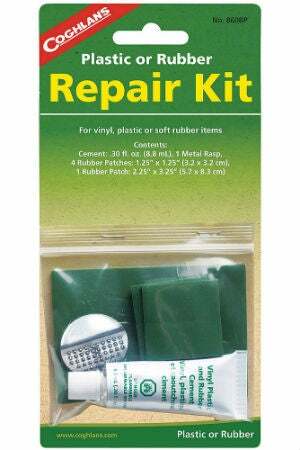 You can also buy patch kits at mass merchandisers and online, or use a bicycle tire repair kit to do the job as well. And if you’re really in a pinch, use any thin plastic material, such as a tarp or a piece of shower curtain liner. Cut the patch about a half inch larger than the hole on all sides. Apply adhesive generously on the patch, particularly in the center. (Super glue, gorilla glue, contact cement, and rubber cement all work well, especially if you have them on hand; if you’re restocking, though, consider picking up Coghlan’s Airstop Sealant, which boasts more than 1,000 positive reviews on Amazon for these sort of repairs and rings up for less than $10.) Now, patch the air mattress hole with this sticky piece of plastic and press down firmly, rubbing in a circular motion to remove any air bubbles and ensure a tight seal between the patch and the mattress. STEP 6: Test that the patch has completely adhered. Place a weight of 10 pounds or more (such as a dumbbell or stack of books) on top of the glued patch and let sit at least eight hours. You’ll want to be certain that the patch sticks, so you can’t be too cautious: Check your adhesive’s bottle to make sure you adhere to its recommendations for cure time, too. STEP 7: Test that the patch has completely adhered. Once the glue has fully dried, remove the weight, re-inflate the bed, and sprinkle a small amount of talc or baby powder over the patched air mattress. Gently press down on the mattress; if the powder goes flying, you may need to re-apply the patch. If it stays put, you can literally rest easy on your success!